From 1960s rock stars to '90s grunge icons to 21st century designers and models, ripped jeans have been a signature look for many of fashion's most major influencers. Whether a strategically placed hole across a thigh and knee or an all-out treatment with dozens of rips, destroyed denim makes a strong fashion statement. Here's how to DIY the look. Look through fashion magazines or blogs for ripped jeans you'd like to replicate. Take a close look at the amount of fraying around each cut. Decide whether you want slits or holes. Pick out an old pair of jeans from your closet or from a thrift shop. (Pure cotton jeans fray more than those made of a cotton-and-Lycra blend.) Try them on and imagine them ripped. Sit, stand and move in the jeans. As you wear them, use white chalk to mark horizontal rips where you want them. Take off the jeans. For a more worn look, sand each area you're going to cut with rough sandpaper. You may need to go over the area again with white chalk. Place a 2x4 wood block inside the denim so you don’t cut through to the other side of the leg. Make your cut with scissors or a knife. Repeat the previous step to make all your cuts. For larger holes, make 1/8-inch diagonal cuts at the ends of your horizontal cuts. Use the end of your scissors or knife to start fraying each cut. Throw the jeans into the washer. Add some bleach if you want a more distressed look. Run the jeans through the dryer. Pull the jeans out of the dryer and try on your new ripped denim. Leave all the frayed pieces alone. 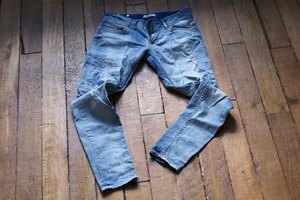 The more often you wash and wear the jeans, the more prominent the rips become. 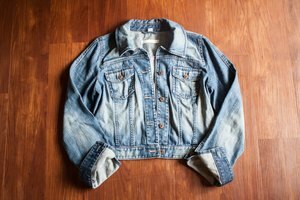 Shop at thrift stores for jeans to save money and be eco-friendly. Seam rippers are another good tool to use when fashioning ripped jeans. You can find them at any fabric store. Each rip will get bigger as you wear your jeans. You don’t want to get too carried away if you want a more subtle look.